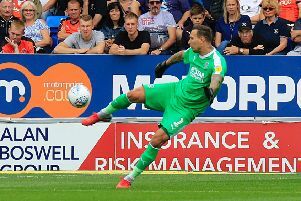 Mark Tyler: 6.5 - Keeper had little chance with either goal as Luton’s defence momentarily lost their usual solidity, especially at Kenilworth Road. Michael Harriman: 6 - Should have done far, far better to stop York’s opener as was outjumped by the diminutive Carson. Having a slight wobble in form right now. Jake Howells: 7 - Could have got tighter to prevent City’s second goal, but bar that, a decent enough showing at left back and one pinpoint cross should have led to a goal for Stockley. Luke Wilkinson: 7.5 - Worryingly withdrawn just after the break with what looked like a groin injury. Hopefully not too serious as Town’s back-line looked weak in his absence. Steve McNulty: 7 - Skipper blotted his 100th appearance for the club with late red card, although Town might choose to review after studying video evidence. Nathan Doyle: 7.5 - Midfielder struggled manfully through the second period as had to give in to injury, but with McNulty’s red, bravely took his place once more to help Town finish with 10 men. Jonathan Smith: 6.5 - Didn’t quite have the guile to unlock the Minstermen defence although as ever, no-one can knock the effort he puts in from first to last whistle. Andy Drury: 6 - Only he will know how he failed to put Town ahead in the first half with a truly shocking miss. Didn’t really offer enough as an attacking force either. Ryan Hall: 6.5 - Some exciting moments from the new signing when he got the chance to stretch his legs. Clearly needs more football to get back to the kind of form he showed at Southend though. Nathan Oduwa: 7.5 - Hugely promising first start in the Football League. Pace to burn and a real directness to his play. Unselfishly set up Drury, while almost secured the victory at the death. Jayden Stockley: 7 - Should have buried a first half header and was unfortunate to see another cleared off the line. Needs support though. Alex Lacey (SUB): 5.5 - Defender looked badly off the pace and his introduction saw Luton almost immediately concede two poor goals. Mark Cullen (SUB, STAR MAN): 8 - Salvaged a point with two clinical finishes. Looked sharp, lively and with a real point to prove. Shaun Whalley (SUB): 7.5 - Real livewire on the wing and produced a magnificent cross for Cullen’s second. A better final ball could have seen Luton nick a winner too.